Thor is the story of Thor, the Norse god of thunder. Thor (Chris Hemsworth, formerly of Home and Away. Don’t hold this against him) is kicked out of Asgard (the home of the Norse gods) because of his arrogance and finds himself in 21st century New Mexico. 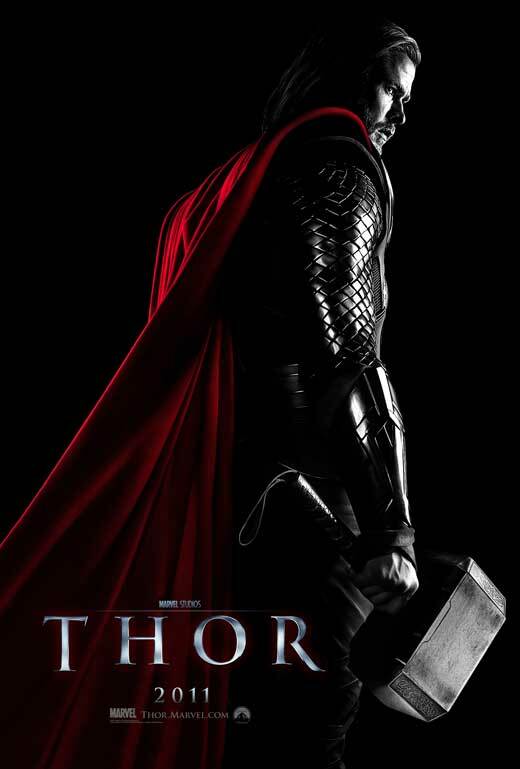 With the help of scientist Jane Foster (Natalie Portman), Thor learns what it means to be a hero. However, it appears Thor’s brother, Loki, is up to no good and everything may not be what it seems. Branagh had a difficult job on his hands here. You’ve got action happening in Asgard as gods go to war against the Frost Giants. You have Thor on earth trying to fit into modern society. And on top of all that, you’ve got to tie into the rest of the Marvel comic movies so Thor can be in The Avengers next year. Somehow he manages to pull it all off. The action scenes are big and bold, the cast punch out some great performances, and there’s a fair bit of humor that’s actually funny and doesn’t feel forced. I really enjoyed Thor and here’s how I can tell: I had to think really hard after seeing the movie to work out what I didn’t like about it. That may sound weird, but when I watch a movie, my critic brain kicks in straight away and points out all the problems with the film. That didn’t happen with Thor. Sure, afterwards I managed to find a few things to be nit-picky about, but Thor managed to grab my attention and hold it for the full two hours. Frankly, I don’t think you can ask for more than that. Thor trots out the science fiction staple that was famously coined by Arthur C. Clarke (the guy who wrote 2001: A Space Odyssey) – Any sufficiently advanced technology is indistinguishable from magic. Thor and his friends may be gods, but they’re not really. They’re just really advanced humans who live in another dimension and have access to technology that looks like magic. Some Vikings saw them in action centuries ago and started worshiping them. While it works in the context of the movie, what it suggests about the spiritual/supernatural is troubling. This is part of a enlightenment view of the supernatural – namely that it doesn’t exist. Everything must have a rational explanation that works in a scientific framework or it doesn’t exist. When this line of thinking is applied to Christianity (and it is), we have a Jesus who is reduced to just an inspirational person who merely taught nice things, not God on earth who performed miracles and rose from the dead. It is wise to be cautious about the effects of this line of thinking. But the thing that really struck me about Thor and the other gods is how human they were. They show characteristics such as arrogance, pride, deception, greed, jealousy, anger. These characteristics wouldn’t inspire me to worship them. They’d have me running and hiding in case I did something to offend them. It wouldn’t take much for Thor and his friends to declare war on you and accidently wipe out your village. They act on whims and make foolish decisions. I was reminded of the time Paul and Barnabas were in Lystra and the people mistook them for gods. In Acts 14, Paul had to stop the people from worshiping them as they were just people. They may have done some impressive things, but the glory belonged to God. “We are bringing you good news, telling you to turn from these worthless things to the living God, who made heaven and earth and sea and everything in them.” (Acts 14:15) The God we worship is not foolish and does not act impulsively. He is just and constant. He is a God we can rely on. And that’s so much more impressive than a guy with a big hammer. If you want to see a larger than life action movie starring a big guy in a cape, Thor is certainly worth your time. If Joss Whedon can put together a movie anywhere near as good as this for Thor’s next appearance in The Avengers then I’ll be a very happy movie critic this time next year. Just saw it. We liked it. Good review.